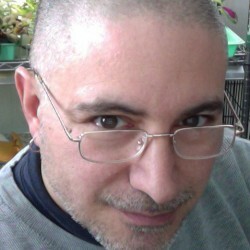 Cory Doctorow is the guy behind Boing Boing. He is also the author of several sci-fi and Young Adult sci-fi titles, including Little Brother (2008), which I’ve just begun reading. This is a volume of short essays that originally appeared as editorials in periodicals like the Guardian, but they’re thematically related and repeat several important themes like Doctorow’s concerns about net neutrality and copyright in interesting and useful ways. One of the most interesting articles was called “Nature’s Daredevils,” and was about writing sci-fi for the YA audience. Although science fiction has always appealed to teen boys, since I was a young fan it could be argued that the genre “grew up” and that authors like Stephenson, Gibson, and Sterling appealed to at least a slightly wider audience. But the old-fashioned sci-fi I grew up with didn’t really have the self-consciousness about being “YA” in the way that term is now understood.Doctorow says “YA SF is gigantic and invisible.” (Doctorow, Cory (2011-10-01). Context (Kindle Location 296). Independent Publishers Group. Kindle Edition.) YA bestsellers are moving ten times the books of comparable “adult” sci-fi. Although YA titles are not taken seriously (yet?) by Hugo and other award committees, they have a wide range of advocates out in the reading world, including teachers, YA librarians, and a big group of genre activists and specialized reviewers. As they should. Unlike adult SF (which now means “speculative fiction” as well as good old sci-fi) Doctorow says kids “read to find out how the world works…[and] use books as markers of their social identity” (Kindle Locations 302-305). The “consequentiality” of writing for young adults is very satisfying, says Doctorow. “Adolescence is a series of brave, irreversible decisions,” Doctorow says, quoting another YA author. Young adults “live in a world characterized by intense drama, by choices wise and foolish and always brave. This is a book-plotter’s dream. Once you realize that your characters are living in this state of heightened consequence, every plot-point acquires moment and import that keeps the pages turning. (Kindle Locations 322-329). This is true, I think. And not only for the SF writer. For the historian too. Maybe especially for the historian, talking to young people about actions and consequences in the past. How much more powerful might some of these stories be, when kids realize that they actually happened. People actually did this stuff, it didn’t just come out of some novelist’s imagination. 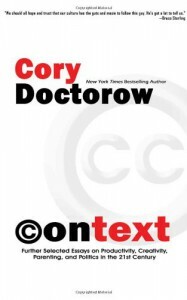 So it’s really possible…The more classic Doctorow articles deal with “intellectual property,” copyright, and new media in interesting and creative ways. For example: “people,” Doctorow says, “who’ve ‘had their property stolen’ are a lot more sympathetic in the public imagination than ‘industrial entities who’ve had the contours of their regulatory monopolies violated,’” and this gives giant media corporations an opportunity to mount an elaborate false-flag operation over copyrights to distract us from their ongoing attempts to privatize the web. (Kindle Locations 1389-1391). And along the way I took down a half dozen names and titles to go out and find, expanding the link-tree. So it was a really useful anthology.